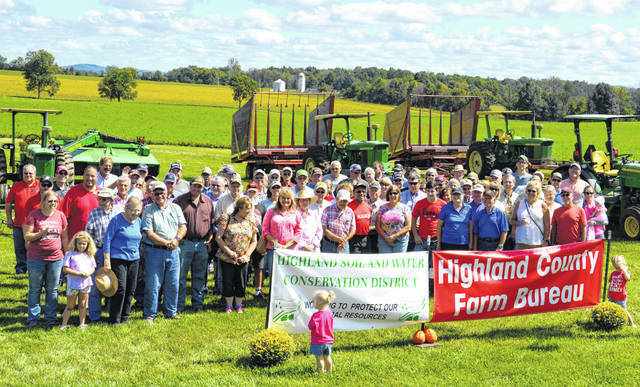 Some of those who participated in the fifth annual Highland County Farm Tour are pictured. The fifth annual Highland County Farm Tour took place on Sept. 15. The farm tour was a result of a collaborative effort between Highland County Farm Bureau and Highland Soil and Water Conservation District. More than 130 people attended the event in the New Petersburg area. The tour featured beautiful, diverse farms and provided beneficial information on local sustainable agriculture. The tour consisted of stops at the following locations: Steven M. Karnes Hay Farm, featuring a presentation on hay/forage management by OSU Extension Forage Specialist Dr. Mark Sulc; Surber Family Swine Operation, where participants learned about the 2,400 sow breed to wean facility; Karnes Orchard, which highlighted the history of the orchard, the new on-site market and how the storage facility loan program through the Farm Service Agency assisted them in purchasing a cooler to extend their season. In addition to learning about these unique farms, participants also enjoyed a presentation from the Cardinal Land Conservancy after lunch on how to protect their farms from future development. The Highland County Farm Bureau and Highland Soil and Water Conservation District would like to thank Reed’s Trailer Sales for supplying a trailer and Family, Farm and Home of Hillsboro for donating bottled water to help ensure the event was a success. Anyone that was unable to attend this year’s event, but would like to be informed of future events, can call 937-393-1922 ext. 3 or 1-888-378-2212 to be added to the mailing list. Submitted by Pam Bushelman, Highland SWCD district operations manager. https://www.timesgazette.com/wp-content/uploads/sites/33/2018/09/web1_FarmTour-pic.jpgSome of those who participated in the fifth annual Highland County Farm Tour are pictured.